Enterprise content management is in a state of disruption. The rate of digital innovation has significantly outpaced the capabilities of legacy ECM platforms. Today’s employees want to find and share business documents just as easily as they can browse and buy a book online. They also want content management technologies to support remote and collaborative working styles. The solution providers are reinventing ECM by offering unique services that can assist organizations in streamlining the business processes, increase employee productivity in a right way, reduce archive and paper costs, structure company knowledge and boost morale throughout the organization considering the advancements in simplicity and clarity of ECM. As technology is evolving the need for an efficient and agile ECM is leading towards a faster development of ECM solutions, which is making the traditional ways to retain data obsolete. With the emerging trend an enterprise is able to integrate ECM with the other business application, giving remote access to the content and customize user interface for different staff profiles. However with so many innovative players in the market, organizations are unable to choose their most beneficial partner that can assist them overcome challenges like managing budget, accurate planning for disaster recovery and efficient backup of content. 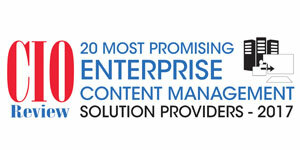 In this edition of CIOReview, we present you the “20 Most Promising Enterprise Content Management Solution Providers - 2017,” featuring the best-in-class implementation of the framework for businesses. Over the last few months, a distinguished panel comprising CEOs, CIOs, VCs, analyst, and CIOReview’s editorial board reviewed the top open source solution providers that empower developers to share and learn through collaboration and have selected the ones that are at the forefront of delivering innovation.